17 July 2016 – The Bahrain High Civil Court ordered the dissolution of the largest opposition political society in the country, Al-Wefaq Political Society, and the liquidation of its assets. We, the undersigned NGOs, strongly condemn the escalation of the Bahraini government’s attacks on political societies, and its repressive acts against all forms of peaceful dissent. On 14 June 2016, Bahraini authorities ordered that Al-Wefaq Society be suspended, and then froze all its assets, halted all of its activities, and closed its headquarters following the Ministry of Justice’s request to the High Civil Court for an emergency order to shutdown the society. The court decision, and the execution of this order was quickly made and the society’s headquarters were sieged and closed, and its website was blocked throughout Bahrain. Although the court had set 6 October 2016, as the commencement of the case to dissolve Al-Wefaq, the hearing was brought forward to 23 June 2016, based on the Ministry of Justice’s request. The court twice moved the hearings to earlier dates than previously scheduled. 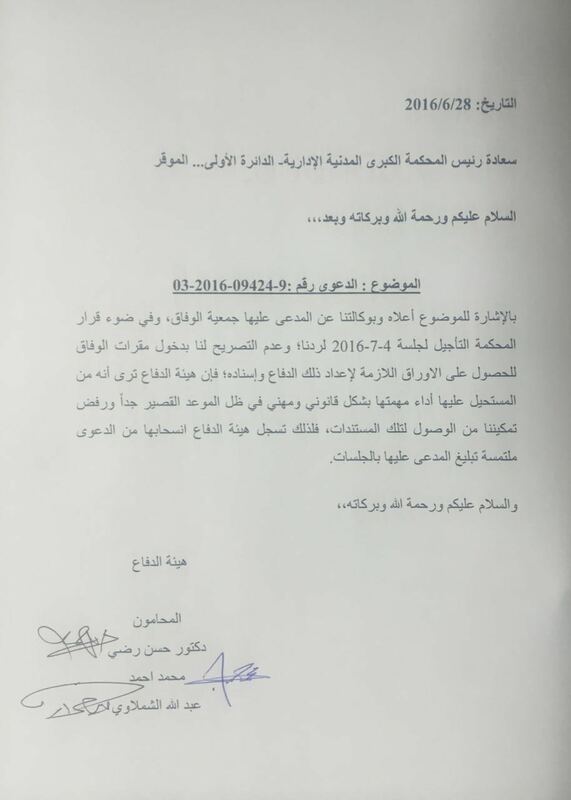 Despite the prevention of proper, or even adequate, legal representation, and the refusal of access to important documents to form defense pleading, today, 17 July 2016, the Bahraini judiciary took the decision to irrevocably dissolve Al-Wefaq and liquidate its assets after just one month since its closure. This and other recent actions taken by the government of Bahrain are gravely concerning. Yesterday, 16 July 2016, the authorities announced the referral of Shia spiritual leader Sheikh Isa Qasim, and other religious figures, to court in order to be prosecuted over charges relating to their freedom of religion – essentially they’re being tried for practicing one of Shia’s main religious duties. This comes following the Ministry of Social Development’s closure of Al-Risala Islamic Society and the Islamic Enlightenment Society. Significantly, these were the two remaining bastions of the Shia Muslim community in Bahrain. On 20 June 2016, Sheikh Isa Qasim had his citizenship revoked, and reportedly is being threatened with forcible deportation. Last month, the Bahraini King promulgated a bill amending the 2005 Political Societies Law, placing a ban on participation in political decision-making based on discriminatory religious grounds. Furthermore, the court’s sentence against Sheikh Ali Salman, Secretary-General of Al-Wefaq Society, was doubled to nine years’ imprisonment. Therefore, we, the undersigned NGOs, call upon the United States, the United Kingdom, and the European Union to denounce the government of Bahrain’s actions, immediately suspend arms sales to Bahrain, and to urge it to call off the decision to dissolve Al-Wefaq Society, and to respect the rights to freedom of association.